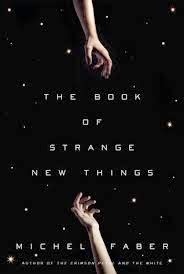 I was intrigued when I first heard about The Book of Strange New Things. The author, Michel Faber, is well-known for his previous books, including The Crimson Petal and the White. It truly didn't sound like anything I'd read before, and I was interested to see where the story would go. Peter, a former homeless drug addict, has completely turned his life around. He's married to the devoted Bea and is the minister of a church in England. Everything is going well in their lives when he feels called by God for an important mission: to travel to a distant planet to minister to the native beings who live there. A large, somewhat shadowy company called USIC has established a permanent settlement on the planet, known as Oasis. Oasis is inhabited and a previous minister has converted many to Christianity. However, this minister has disappeared, and the natives are asking for a replacement. Bea is equally proud and alarmed by the fact that her husband is going to be going on a mission so far away. Still, he's only planning to be away for around 6 months and so that doesn't seem so bad. Once Peter arrives on the planet, he is struck by several things. The planet is hot, and the concept of a "day" is somewhat misleading, since their hours of light and darkness are very different from what he's accustomed to. The atmosphere is very unusual, with tendrils of air that move along the body and inside clothing. The food is also very odd. It's all made from a native plant called whiteflower, which can be prepared to taste *almost* like any familiar food you'd care to imagine, based on when it's harvested. He's very nervous about meeting his flock. The pharmacist, a woman named Grainger, drives him out to the Oasan settlement, which is located quite a distance from the USIC base. The people in the USIC settlement trade medicine to the Oasans for the various foods they've made from the harvested whiteflowers. Peter is a bit shocked by his first glimpse of the "alien" Oasans. They are all clad in robes (each a different color so he is able to tell them apart), but their faces don't resemble human faces at all. Still, the group he meets are "Jesus Lovers" who have been converted by the earlier pastor. They are identified by numbers -- Jesus Lover One, Jesus Lover Twenty-Four, and so on. Not everyone is converted, but the devoted Jesus Lovers are the only ones that Peter interacts with. He needn't have worried. The Oasans are calm, kind and placid. They immediately get to work building a church. They call the Bible "The Book of Strange New Things" and already know many of the stories from it. However, they have trouble pronouncing the letters T and S, so Peter sets about making small booklets paraphrasing sections of Biblical passages to avoid these troublesome letters. He spends several weeks with the Oasans, then goes back to the USIC headquarters for a while. Peter eventually begins to experience some changes. He loses a lot of weight, suffers severe sunburns (although he doesn't seem to notice) and has problems remembering people and events from his life. He communicates frequently with Bea via "the Shoot" a sort of email communication device. The news from home isn't good. There are many natural disasters, food shortages and general mayhem taking place on earth. Peter feels both helpless and detached from the events, but he is worried about Bea and tries to reassure her. As I was reading, I was trying to figure out where the book was going. Were the Oasans as calm and "Jesus loving" as they appeared, or was there something more sinister about them? What happened to the previous minister and another employee who disappeared? What is USIC's real agenda? Are there other animals on the planet other than the strange, small birdlike creatures they observe at times? Why are all the other employees so devoid of emotion? Some of the questions are answered, but overall, there's no big conflict or resolution to the story. I feel a bit disappointed, because I was expecting something major and shocking to happen, but this was really just Peter's story of his journey through life. He grew to realize what he valued and how he should live his life to reflect that. I can't see Hollywood making it into a film without adding a few explosions or evil-doers, though! I did enjoy the story, it just wasn't what I was expecting, so it was a bit of a letdown.